In this photo released by the Museum and James Wang and Jia Li of Penn State shows a known forgery "The Sea at Saintes-Maries", left and the brushstrokes of the image at right. To detect fakes, the painting is divided into 2.5 inch by 2.5 inch sections. 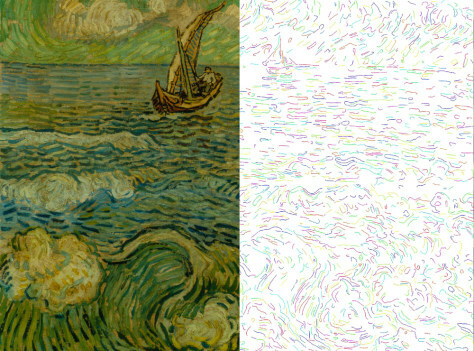 Each brushstroke is compared to a computer model devised from scans of 23 unquestionably authentic van Gogh works. The strokes are examined based on their length and steadiness.